So you bought an intranet, now what? This is the final article of the series providing tips on how to run a smooth and successful intranet project. In Part I, we discussed Determining Project Deliverables and Using an Intranet Project Checklist. In Part 2, we discussed Building your Intranet Implementation Team and determining roles and responsibilities. 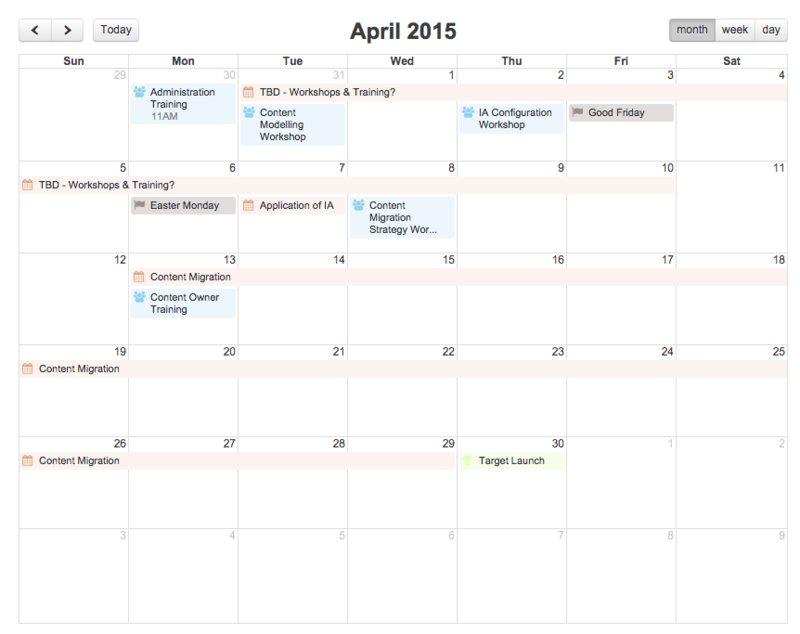 The final step in intranet software implementation is timeline and scheduling. Launch approach: What will your launch look like? Launch date: When are you going to make your intranet available for everyone to use? Are there any external dates that you can tie the intranet launch to (for example, a company townhall, a merger or acquisition, or a new strategic plan). Size of intranet team: How big is your team and how much time do they have to dedicate to the Intranet? Bandwidth of intranet team: What is their bandwidth? Will they have full time availability to work on the intranet launch? Or do they have other priorities that they need to work on as well? Previous tool expiration date: Do you have a hard stop date on a previous intranet system? For example, if your previous intranet tool (if you had one) is going to become obsolete on Dec 31, then it’s pretty obvious that your target date to launch your new intranet will have to be before that time. There are some fundamental activities that are critical to your intranet software implementation project. Instead of using a project planning template, we recommend planning your project right inside your new intranet. Your intranet has a calendar, a space for meeting notes, and a place to store documents and assets. Plus, it gives your project leaders the opportunity to get hands on experience with the new software. 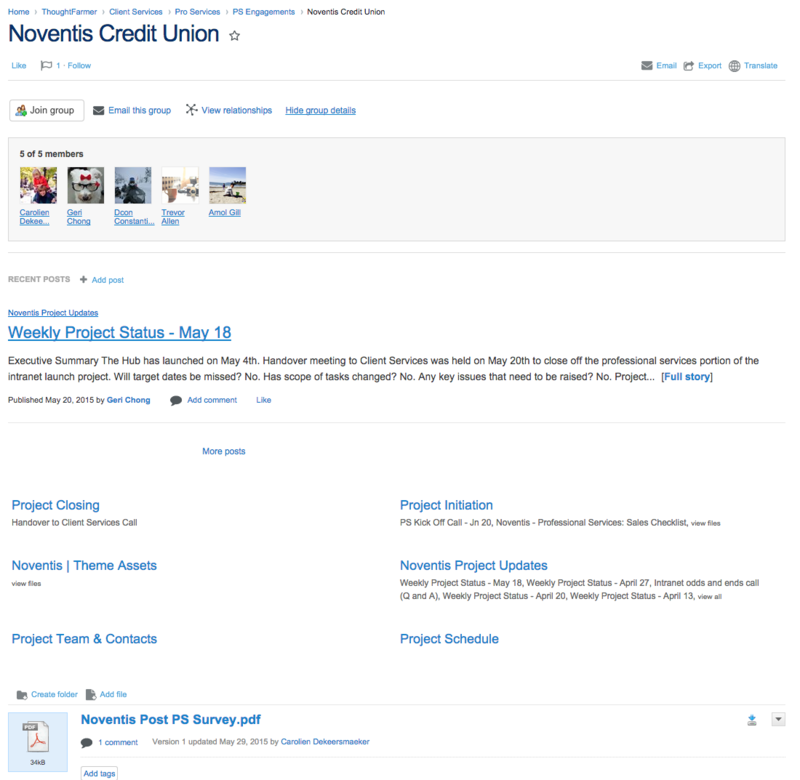 Here’s an example from Noventis Credit Union‘s intranet project group. Using ThoughtFarmer blogs and groups it is easy to manage your project plan right within ThoughtFarmer. The first activity to tackle is taking an inventory of your content. This is a crucial step when you go to migrate your content later on. You can read about content migration, and also download ThoughtFarmer’s intranet content migration spreadsheet to help you with the transition. Content inventory and content migration are very important, so don’t rush through these steps and most certainly don’t skip them. 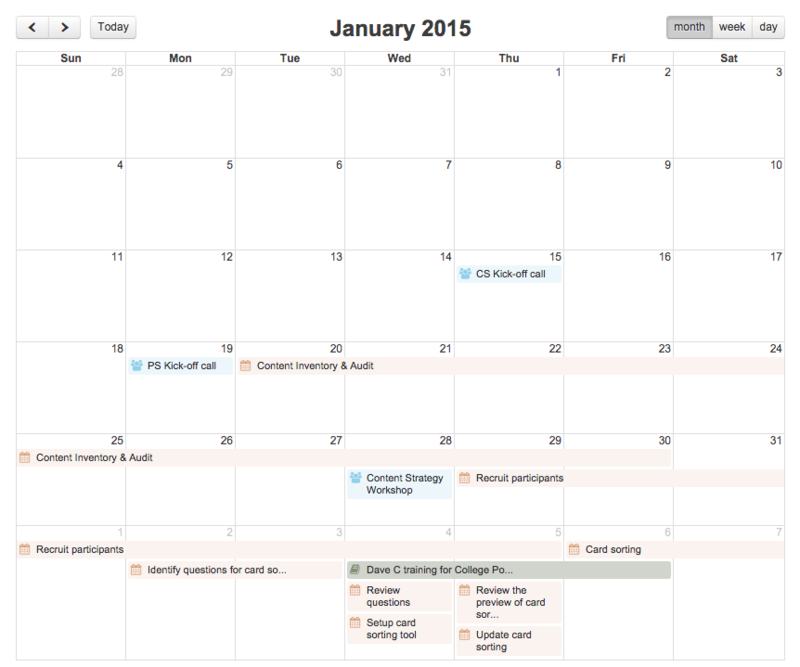 Use ThoughtFarmer calendars to manage timelines for your content inventory. After you have made an inventory of all your content, the next step is to start working on an Information Architecture (IA) Design. This step involves planning the structure of your content and establishing what your intranet navigation is going to look like. The goal is to make content as findable as possible. A lot of our clients consult the ThoughtFarmer Professional Services team to guide them through this process. 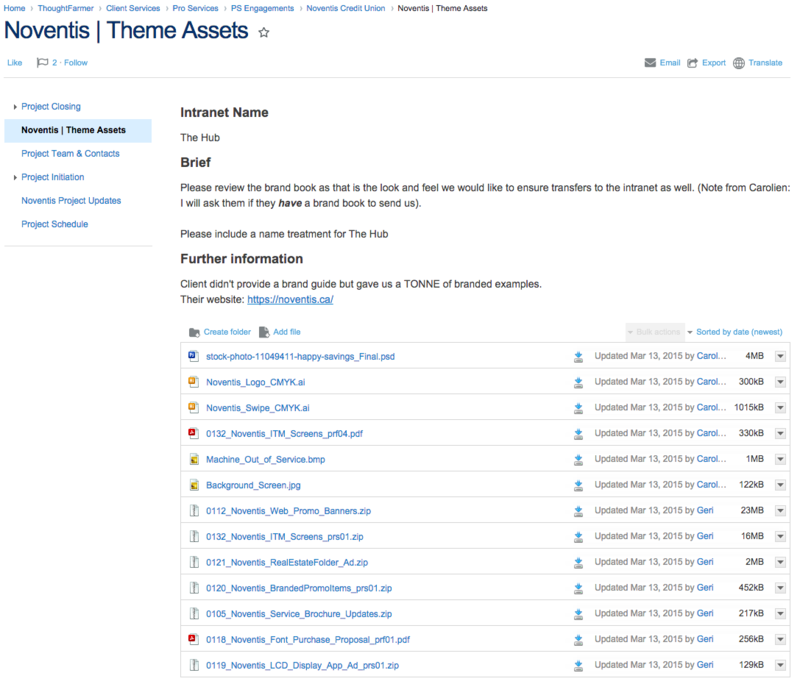 But if you choose to tackle this on your own, we have a great How-to Guide for Intranet Content Audits. The look and feel of your intranet should reflect your company and its unique culture. A meaningful, well-designed intranet brand will encourage adoption and engagement. Steps include coming up with a name for your intranet, working on logos, and defining colour guides. For more information, see Three Ways to Define your Intranet Brand. You need to have a measurement plan in place before you launch your intranet This is a very common mistake we see). It’s worthwhile to define the key measurements you want to keep track of on an ongoing basis and set up the right measurement tools, so you will be able to report on them. For some tips on how to create measurements for your intranet, we recommend you read The Best Intranet Metrics Measure Business Outcomes, or 8 Key Intranet Metrics You Should be Tracking. However you choose to launch your intranet, one of the main objectives is to get staff excited about the new tool; so be creative and have fun with it! Your intranet timeline will depend on the availability of your internal resources and how much content you need to migrate . It typically takes about 2-4 months. For people to get full use out of your intranet, they need to know how to use it! Training can happen at different times of the process for general users. However, intranet managers should be trained fairly early to know the in’s and out’s. Setting out a clear intranet project timeline at the beginning of your implementation makes all the other steps so much easier! Good luck with your project and get in touch if you’re looking for help implementing your intranet. Need a quick refresher on what you learned throughout the series? 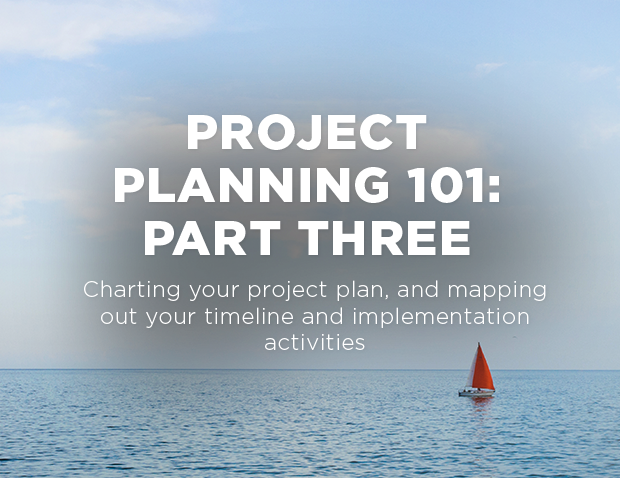 Polish up on determining your project deliverables in Project Planning 101: Part One. Remind yourself how to effectively resource for your intranet implementation project in Project Planning 101: Part Two.